My buddy and I started scouting a property of ours in early July. We were able to get several pictures of this buck on trail cam as well as a short video clip as he made his way across a ridge top that ended up being his final resting place. 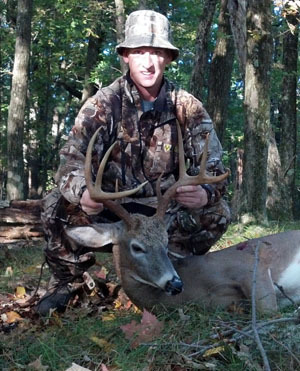 Opening morning, October 1, 2012 at about 6:45 a.m. a small 6-point came up the ridge to me. As always I stood up and took a couple practice draws on him as he went by at different distances. After the third practice draw he stopped and looked back down the hill which I knew meant only one thing. Another deer must be following him up the hill. To my surprise I glanced back down the hill and there he was. Not wanting to give him an "eeerrrrttt" to alert him I waited at full draw until he stopped. As he went to feed I let my arrow fly. My 30 yard shot hit both lungs and he only went about 50 yards before falling over. Couldn't have asked for a better start to the season. I hunted that property that morning for that deer and luckily enough I was in the right place at the right time. He ended up only being 3.5 years old but in my eyes way too nice of a buck to pass up. My biggest to date. 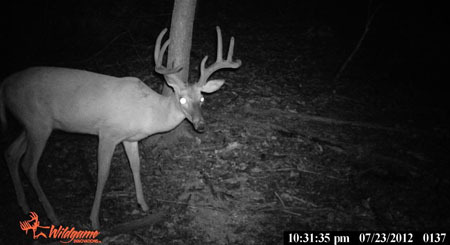 Mick's Westchester County buck caught on trailcam green scored 121-3.